I regret that this vector could've been better and especially the color. The scan was like frickin dark especially for Athrun. I had to guess and put my eyes close to the laptop to see if the colors looked correct. 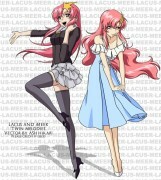 Scan: Scan of Athrun & Cagalli was by me. Oh, my, it's so cuuuuute, moon-san! <33 A tad big, though. But I guess I used to do that too. I like how the color came out, it's always good to use the eyedropper tool and then lower the color in the color range. That's what I do or you could always level the scan to make it lighter. 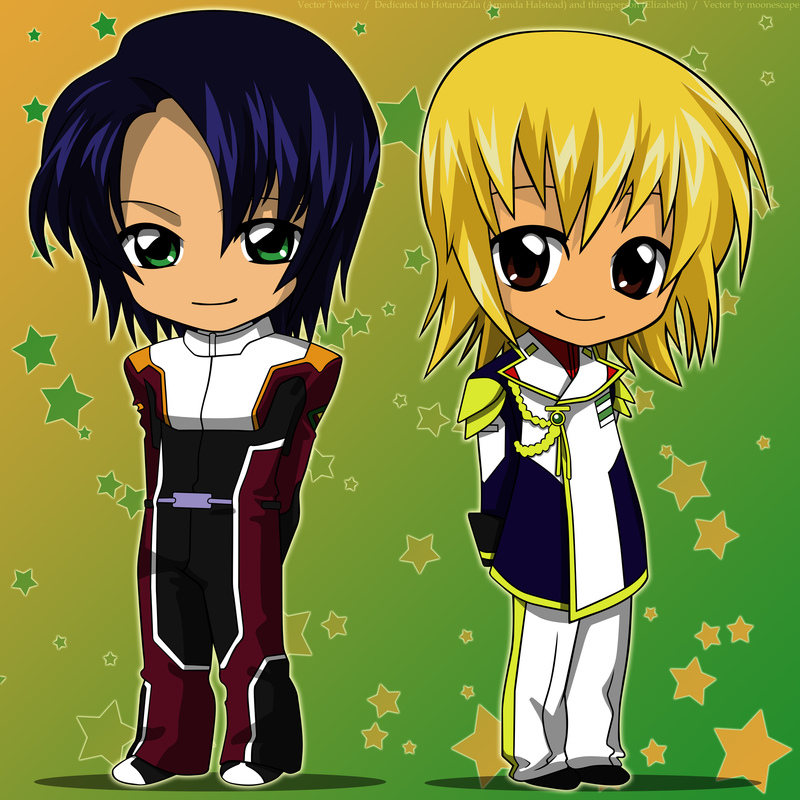 Ajajaj, kawai ~~~~ athrun and cagalli chibi! Together! Other one astonishes of his vector! :D is a very good work I begin! Congratulations! haha.. Saw your scan of the 2 stickers. I bought the Athrun one sometime ago! They're for sticking on your handphone, ipod, etc, aren't they. I put it on my laptop cover. I've been trying to find the Cagalli one so that I can stick them together side by side. :D But it's not easy, seeing how Gundam Seed (Destiny) is not a particularly new anime. Great vector, by the way. They look so cute together! OMG! KAWAIIIII! LOVE IT! THANKS! Oh my gosh moonescape this vector is so pretty i love it so much im amazed by you really your the sweetest thing ever thank you so much i love how cagalli and athrun look i love this scan and the vector is so pretty im amazed really and your the sweetest thing dedicating it to me and your so welcome for the birthday card i consider us best friends to and i really appreciate this your the sweetest thing for doing this *hugs so much* i love this so much thank you so much your the bestest..*hugs*. This vector is so adorable. Despite the dark colors, I like the lines and depthness. The background really fits the characters. Good work. Adding this to faves. O Gosh! This is sooooooooooooooooo....cute! Cagalli is a sweatheart here! Unlike her personality she look like good little girls. But Athrun looks a bit naughty. Yup! Chibi Athrun looks palyful here and I want to know why?! :D Lols* Great Job!